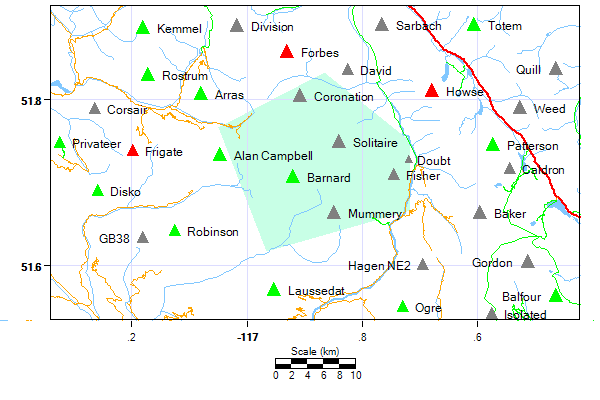 Area: 360 sq km.Location: The Freshfields is the name associated with the peaks to the west of Howse Pass, which at one time was considered for the transcontinental railway. Thus they lie to the northwest of the Wapta Icefields, in the big crook in the Alberta-BC Border. The Freshfields is the only place you can ski EAST and cross into British Columbia. On the south, it is drained by the Blaeberry River, which goes into the Columbia River north of Golden. On the northwest, it is drained by Valenciennes River, which flows into the now flooded "Bush Arm" of Kinbasket Lake (the flooded Columbia River). On the north, it is drained by the east flowing Howse River. Terrain: Due to its closer proximity to the wet climate of British Columbia, the terrain is more heavily glaciated than the typical Rocky Mountains Icefields further west - glaciers are a bit more heavily covered insnow. The traditional access has been from the east - skiing up the Howse River. However, it is increasingly approached from the west, by driving up the Blaeberry River from Golden BC. History: The Freshfields Icefield and Mount Freshfield itself were named after Douglas William Freshfield (1845-1934) who was editor then president of the Alpine Club based in London , England.